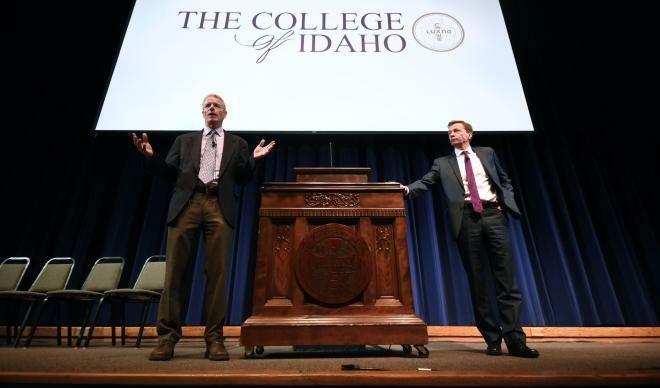 Inside Higher Ed reports on long-time businessmen and former trustees at the College of Idaho Doug Brigham and Jim Everett, who are preparing to become co-presidents of the private liberal arts college. The College of Idaho is not the first institution to operate with a dual president system of leadership. St. John's College in Maryland is managed by two presidents stationed in Maryland and New Mexico, respectively, but only after a former board member decried the leadership arrangement as detrimental to the Annapolis-based school's identity. College trustees endorsed the idea, in part, because of both men's previous connections to the board, their familiarity with each other and with the surrounding business community, and their plan of splitting divisions equally and using the board as the deciding vote on issues upon which the co-presidents disagree. The idea of a co-presidency may be new in higher education, but it is not new for colleges and universities to assign exclusive oversight duties to provosts and vice-presidents; specifically academic development, fundraising and student affairs. This separation of administrative focus has always been viewed as a way to maintain innovation and diversity of approach in the academic enterprise, so it is reasonable to see how some would question the approach of two voices serving as the final authority on enterprise-level direction. What happens if campus constituents become divided on one style of leadership versus another? What happens if trustees become divided and force a resignation; are both presidents expected to leave, or just one? Will the dual presidency become a permanent structure for the organization, or just for this particular administrative era? Most presidents and trustees would not consider a dual-president leadership structure, but the College of Idaho can present possibilities for the way leadership structures are viewed and assessed. If a president, provost, vice-president and even deans have very clear responsibilities and performance-based metrics, it makes for an easier system of showing stakeholders how the university's vision and mission are lived out by an administration, and how effective its leaders are at implementing that vision. Inside Higher Ed Are two presidents better than one?